Hearthstone’s dungeon expansion, Curse of Naxxramas, will take adventurous card sharks (and orcs, humans etc) to the floating necropolis of Naxxramas for good times and boss battles this month. Today, Blizzard’s broken down the pricing and bundles and introduces the very World of Warcraft Heroic mode. If the upcoming expansion is piquing your interest, but you’re fresh-faced and deckless, take a look at Nick’s best Hearthstone decks for beginners. Naxrammas will open up one wing at a time, starting with the Arachnid Quarter. The first wing will be free during the launch event, which will last for a month. You’ll be able to get started without dropping a dime. But the subsequent wings, each of the four unlocking week by week, will be premium content. Don’t fret though, as you won’t have to remortgage the house or sell your gran to afford them. For 700 gold (£4.99/$6.99) you’ll be able to unlock either the Plague Quarter, Military Quarter, Construct Quarter, or Frostwyrm Lair, and of course that gold can also be earned in game by completing quests. If you don’t want to buy each wing for £4.99 individually, you’ll also be able to grab one of the dungeon bundles. If you missed the launch event and didn’t get Arachnid Quarter for free, you’ll be able to get all the wings for £17.49/$24.99. 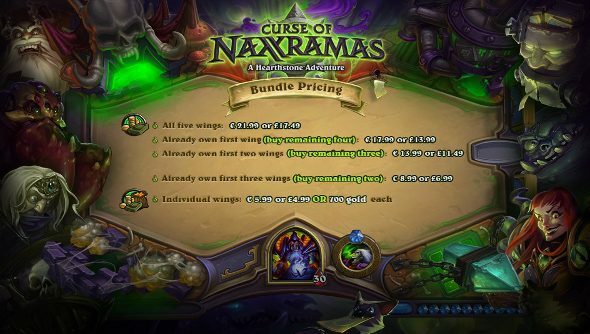 That’s actually cheaper than getting Arachnid Quarter for free and buying the following wings individually. If you go ahead and by some individually, but then want to buy the others together, that’s also an option. Just as Naxxramas comes to Hearthstone via World of Warcraft, so does the newly announced Heroic Mode. Upon completing Naxxramas, adventurers will be able to repeat the dungeon, but this time with tougher foes. For getting through the challenge, you’ll net yourself a special card for your deck. Will you be entering Naxxramas at launch?